Photograph: Andrew Leyerle In bestowing this important and prestigious award, the Committee wishes to recognize Kai Chan's outstanding practice and career as an internationally acclaimed artist. 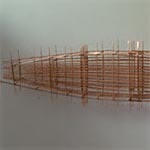 Although primarily associated with the field of textiles, his work straddles many craft genres and has links to jewellery, basketry, fashion, and toys. But whatever the medium, Chan's work distinguishes itself through the minimal use of unexpected and modest materials that, while lyrical and wonderfully imaginative, are masterfully manipulated into inventive pieces that echo the meditative aesthetic of his cultural heritage. Kai Chan's work, constantly evolving and exploring new territories, remains uniquely personal. Kai Chan, internationally recognized for his experimental approach to the art of textiles, immigrated to Canada from China in 1966. 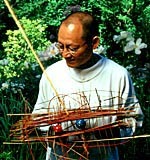 A part-time instructor at the Ontario College of Art, Chan is based in Toronto and conducts workshops across Canada. Chan's work straddles many craft genres and has been exhibited and described as jewellery, basketry, tapestry, fashion, bookwork, fibre work, toys, contemporary art and sculpture. He has exhibited extensively across Canada, as well as in Austria, Australia, Finland, Germany, Hungary, Japan, the Netherlands, Norway, Poland, Spain, Sweden, the United Kingdom and the United States. The Art Gallery of Mississauga, the Tom Thomson Memorial Art Gallery and the Museum London in London, Ontario, recently mounted a major solo exhibition of Chan's work, Kai Chan: Rainbow Lakes, which will continue to tour across Canada in 2002-2003. 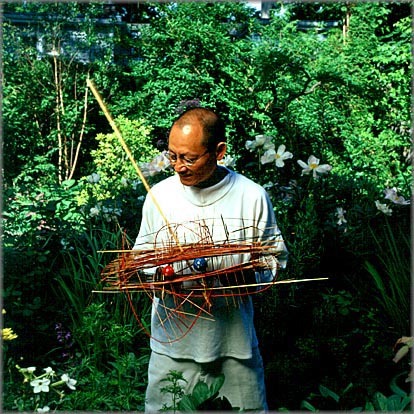 Chan's work is represented in numerous private and public collections, including the Canada Council Art Bank, the Canadian Museum of Civilization, the Ontario Crafts Council, the Nordenfjeldske Kunstindustrimuseum, Norway, and the Art Gallery of Szombathely, Hungary.